Adam Lippes knows luxury. He learned it as the right hand to the late Oscar de la Renta and it is literally threaded throughout the hand-sewn finishings of his demi-couture clothes (which he is obliged to sell at ready-to-wear prices). But if in the past his collections have veered towards precious, or even haughty, Lippes has remedied that this season with an appeasement to womanly comforts that are as liberating as they are indulgent. 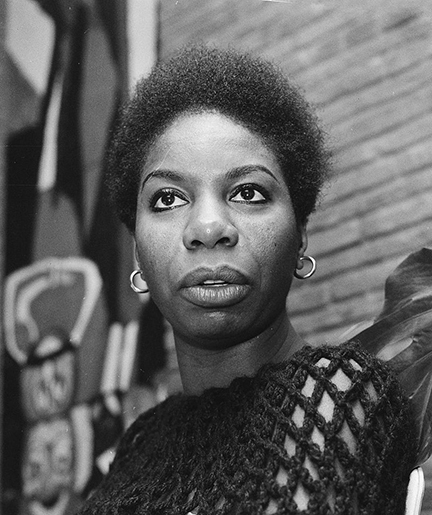 It is the justly outcome when you take on sultry songstress Nina Simone and austere artist Agnes Martin as inspiration. Seemingly disparate, the two women share an utterly modern point-of-view and a resilient but quiet strength. Lippes has harnessed these qualities and has transmuted then into the rarest form of luxury in our modern day: humility. It was the the righteous contradiction of humble luxury that erupted into one of Lippes’s best collections ever. 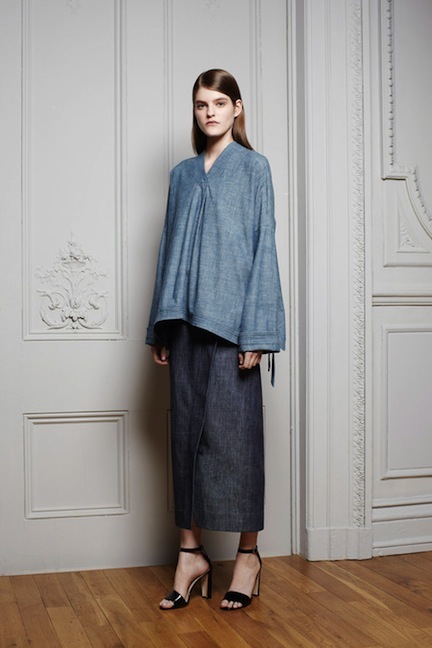 Taking cues from the the monastic simplicity of Martin’s artist dress as well as Simone’s own sumptuous, though inconspicuously so, style, he presented a collection of quiet clothes that sang. They were quiet in their shapes: easy and unassuming, shapes that a woman could easily slip on, flatter her, and give her no further fuss as she goes about her day. And they sang in the details: the hand-stitched silk grossgrain placket on the back of a cotton tunic, stitched just so as to ensure the neck lays perfectly. They sang in the the multitudes of finely pleated cotton, cut in a peasant shape, as luxurious as any pastoral costume worn by Marie Antoinette on her faux farm. The height of modesty came in a bleached denim apron dress with an inventive and aesthetically delightful tie in the back. Its hem was bound, turned up and blind stitched by hand. It was nearly sinful in its decadent ease. But a Lippes collection is never whole without the flexing of his couture muscle. A jumpsuit, overlaid with a knotted silk cording came from a reference to Simone’s penchant for macramé. Uniform in appearance, not one of its perfectly formed squares are alike; each are subtlety altered in size and angle, through a process painstakingly executed by skilled hands, as to move flawlessly over the curves of a woman’s body. The reward of such intricate and time-consuming effort, not to mention cost, is perfection. 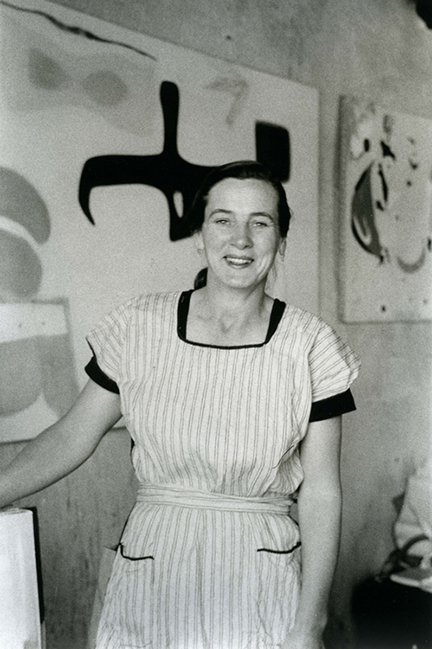 The notes for the collection featured a quote by Agnes Martin: “Simplicity is never simple. It’s the hardest thing to achieve” and Lippes proved he knows this better than anyone else. The thing about Adam Lippes’s clothes, what makes them so striking to behold and what look book images cannot show you, are the details. Working in unison with his appropriately classic but deceptively modern shapes, they are a whisper of opulent restraint. No heavy-handed embellishment. No unruly color. And (thank the stars) no prints (they would sully the clothes). For Lippes elegance is, as Chanel said, refusal. What he decides to leave in the garment, what makes the cut so-to-speak, is so perfectly conceived, balanced, and finished that the entire garment emanates a perversely urgent feeling of desire. 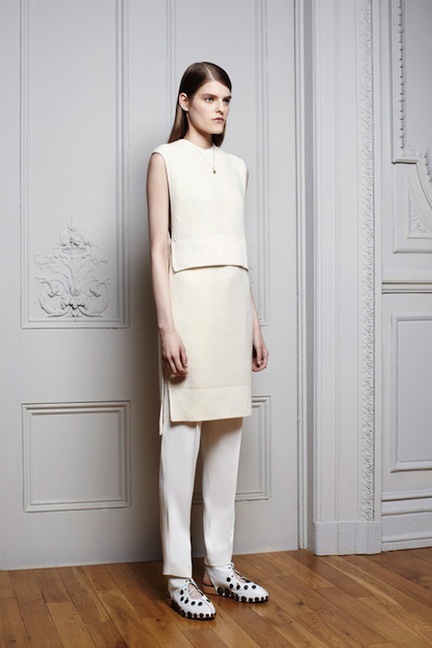 One piece that illustrates this best is a simple silk crepe T in alabaster pink. It’s perhaps the most basic piece in all the collection, not anything especially new, yet, the proportion of the stitching along the hem and neckline was so cleverly spaced as to activate an even more flattering proportion with the slope of the sleeve and the width of neck that it could make almost any woman, be she slim or thick, beautiful or homely, young or old immediately look brighter, prettier, shapelier and possibly even smarter once worn. The fabric was so luxuriously lush, the bottom and sleeve hems were so perfectly finished and the cherry on top, the piece de resistance, was the buttonless henley-style placket with a single fringed silk tie looped through the top buttonhole. Lippes makes the mundane so magnificent. What else is luxury good for? Another moment of micro drama was a row of hook and eye closures set in silk grossgrain on the side vent of a black sweater knit. It is, to the undiscerning eye, a nothing piece. But so beautifully knitted with the finest yarn, so smartly trimmed with the most classic notions, the whole garment is elevated beyond its ordinary functions. Its presence so striking I imagine one could wear it in lieu of an evening dress and very likely be the best dressed of the night. However, Lippes’s actual thoughts for evening are a just as potent. There was a white silk racerback floor length gown with a fringed tassel hanging from one shoulder strap. It had pockets (yes, pockets!) and the most wonderful detail yet: a single French seam running down the complete length of the center back. Is it a construction line he beautified? Is it purely decorative? I didn’t ask and I didn’t care. God was in the details and it was divine. All the fringe came from inspiration taken from Moroccan textiles, namely carpets. And though this theme was iterated throughout the collection rather tastefully it had its most inventive realization in what was surely the masterwork of the entire collection: a silk tank dress bordered along its low waist by a floor length curtain of plisse silk. Yards upon yards of hand pleated fabric on such a simple silhouette, in most other designer’s hands this would be an abomination with the overwrought manipulated fabric destroying the natural ease and modernity of the base structure. But done by Lippes it is a quiet affair no more bulky or assuming than a slip, that is until the dress is in movement and all the layers of silk release and expand into a glorious flutter worthy of a bird of paradise. I could watch that dress in slow motion with a Philip Glass soundtrack and be very content for a while. Lippes’s clothes are beautiful and immaculate. His hand loomed silk jacquards, his hand tailored jackets, his plisse gowns; they are the epitome of modern luxury but they are precious almost to a fault. His clothes are so fine that while it is easy to imagine any woman wearing them it was more difficult this time around to see her living in them. Lippes has a hand for luxury and leisure, one that will make this collection a sure hit, but it would have been nice to see clothes that might be improved with a bit of dirt and grime, something sturdier that wouldn’t be so out of place on a subway car. Perhaps I am asking too much, but I’d like to a see a woman dressed by Lippes for all of life’s occasions and I’m sure he would, too. One wondered what the future had in store for Adam Lippes after he narrowly escaped fashion purgatory and bought back his name from Kellwood two years ago. Since then he’s retooled his design manifesto and company culture, abandoning corporate ambition and distancing his clothes from a cannibalizing contemporary market. Today he runs a smaller and more familial operation, the kind required nowadays if a designer is to truly engage luxury clothing in a sound and sustainable manner. It’s certainly no easy feat but going by the clothes Lippes’s efforts have certainly been worthwhile. 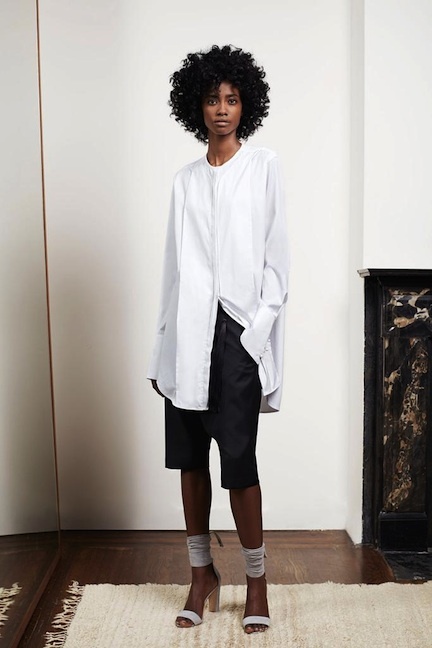 Over the last several seasons he has distilled a design vernacular built on the tenets of the best of American fashion: ease, sportswear, classicism, timelessness. For many designers working in New York these tenets can become tenuous, reduced to corrupted clichés haphazardly spat out to journalists, conflating the words “classic” and “uninspired.” Should you ever forget what it means for a garment to be timeless, for it to truly evoke that rare sensation of imperishability, Adam Lippes serves as a refreshing reminder. 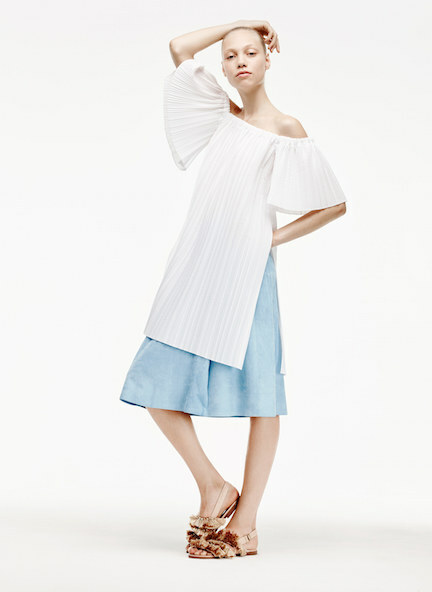 The new resort collection reads like a “best of” of American fashion in the 1970s when its designers, armed with a minimalist rigor, soft fabrics, sportswear separates and a fashionably fluid line, championed a new modern woman. That those ideas, updated with a thoughtful and utterly contemporary sensibility, that they can look so new and bold today as they surely did then is a testament to their infinite appeal and Lippes’s adept ability in handling them. 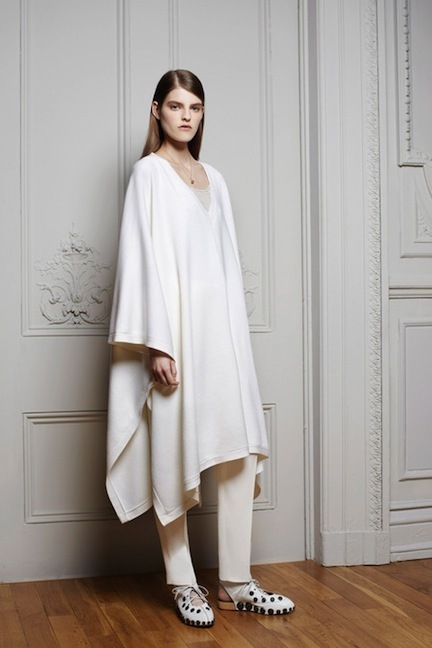 The spirits of Zoran and Halston are present in the floor-length monastic dresses, coats and square cut tops. Fabricated in the most luxurious silks and cashmeres they are no less minimal or exquisite than what those minimalist masters managed in their prime. 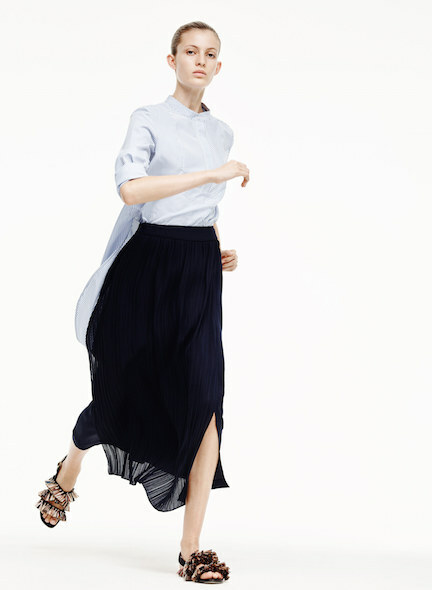 The flirty but pragmatic appeal of a paper bag-waist in a striped cotton pajama pant and in a leather skirt echo Donna Karan and Louis Dell’Olio’s seductively sensible efforts for Anne Klein. The trapunto stitching used on collars, waistbands, and belts throughout the collection, notable on a v-neck Korean do bok top (rendered in fine silk and chambray) brought to mind the worldly explorations of Bonnie Cashin, a designer who never shied away from adapting an idea from the other side of the globe if it could coax a modern innovation. 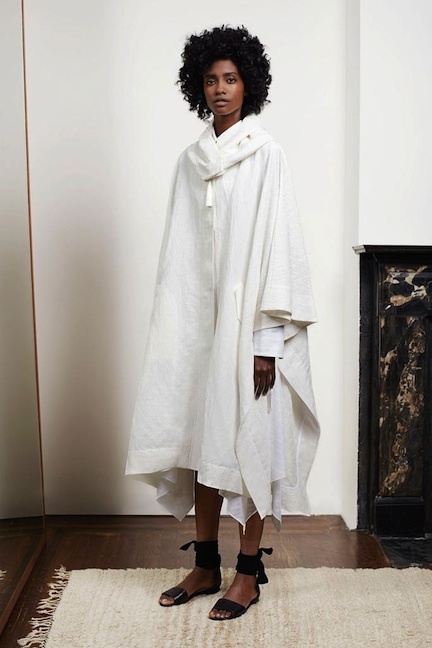 To mention that the clothes Adam Lippes designs are impeccably crafted and finished is redundant as quality workmanship is necessity when addressing simplicity and minimalism. 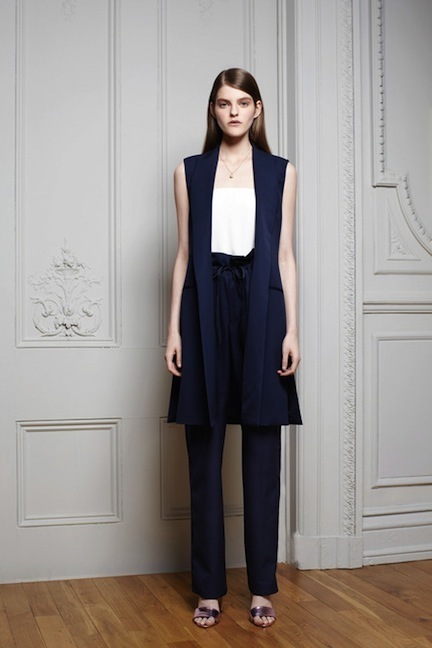 But, from design to construction, Lippes’s clothes are beautifully thought out. Every line, stitch and fold is crafted and considered. And whether it be silk, cashmere coating or humble cotton poplin, each fabric represents the most refined of their genre. It stands to be reiterated: the clothes are impeccable. And they must be, the customer Lippes addresses is a discerning one. She is a woman who demands the best and is to willing to pay for it. She can’t be bothered with trends or fashion shenanigans, she is too sure of herself for those. She expects her clothes, like all the best clothes do, to enhance her own natural appeal, not obscure it, and to grant her ease and therefore elegance as she gets on with her life. One could say after such a bold move to relaunch his name and under such risky auspices that Adam Lippes has come out a winner. Working out of an enchanted townhouse in the West Village, a real modern maison, he has escaped fashion’s distracting din, enabled to toil on his beautiful clothes with integrity. Indeed, Lippes champions forward, but the real winners are the women who get to wear his clothes and live in them.